Weather looks great until we get closer to the weekend…..figures! Rain chances start popping up Friday. By Saturday, it’s up to 90% chances and a little less on Sunday, especially in the a.m. Monday is back to sunshine and temperatures in the upper 70s. This will be the trend for next week. Right now we have three flood gates open at approximately 3900 cfs and the generators are running 6000 cfs +/- Good drop from what we have been fishing. We understand that one of the sections of head water gates on Powersite has been damaged by the flood. It is stuck in the down position. They may need for Bull Shoals to drop to a level where they can safely access the air lines under the dam to repair the problem. In any event, we do expect to see water flow for awhile. Stan and Jim on the last Thursday with a group of guys from Virginia and Oklahoma. Fun day for these guys. Jim had John and Kim. They were bringing in fish on the tiger tail and the hot hare’s ear nymph. Stan’s guys were catching on the lightning bug under the big ruby, or stripping the holographic green crackleback on a 7 ips sinking leader. The 23,000 cfs flow didn’t slow down these fly fishers. 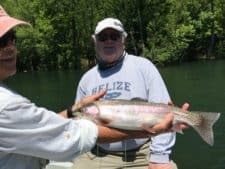 Saturday, Jack and Brian, from Connecticut, spent the day on the water with Stan. They had just finished the 2-day Orvis school and both were ready to catch fish! Mission accomplished. Wonderful day for these guys on the lightning bug (so they worked on nymph style fishing) and stripping the holographic green crackleback. Still a lot of water moving, but no problem. Dana had Jack out for half a day. It was the lightning bug or steelhead orange egg for them. Pam and Tiffany from Oklahoma spent half a day with James. Despite a rough start, they finished up with a good day on a white jig, brown San Juan worm, and the little ruby midge. stripping the holographic green crackleback. I think they took some cracklebacks home with them to try in some of their fisheries. 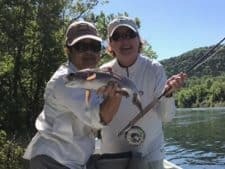 This entry was posted on Tuesday, May 16th, 2017 at 10:26 am	and is filed under Fishing Reports. You can follow any responses to this entry through the RSS 2.0 feed. You can leave a response, or trackback from your own site.